RAMSTRENGTH™ supports local cancer survivors by providing financial assistance for basic needs, scholarships, programs and services. RAMSTRENGTH™ is the only local non-profit that provides financial assistance for all types of cancer survivors in Fort Collins and Northern Colorado. Thanks to great support throughout our community, RAMSTRENGTH™ has raised over $2.5 million to help our friends and neighbors fight cancer. In addition to our longstanding partnership with the Poudre Valley Hospital, we now have partnerships with the McKee Medical Foundation, expanding our Basic Needs program into the Loveland area. We also expanded our scholarships to include Camp Wapiyapi, another Children’s Cancer Camp in Estes Park, opening more opportunities for local children to attend camp. Looking ahead, we are very excited to share with you our plans in helping many more people. 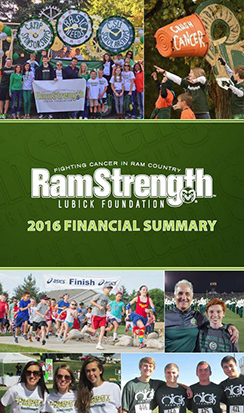 RamStrength will be bigger and better than ever as the Lubick Foundation’s RamStrength Organization. We are now a 501(c)3 non-profit foundation. This change will allow for expansion and growth opportunities helping us to meet our goal of never having to turn anyone away.Please consider making a donation today! You can donate online or use the link below to download and print the donation card and mail it to the address provided.